The singleton pattern is a fully paid up member of the GoF's patterns book, but it lately seems rather orphaned by the developer world. I still use quite a lot of singletons, especially for factory classes, and while you have to be a bit careful about multithreading issues (like any class actually), I fail to see why they are so awful. Stack Overflow especially seems to assume that everyone agrees that Singletons are evil. Why? Please support your answers with "facts, references, or specific expertise"
They carry state around for the lifetime of the application. Another hit to testing since you can end up with a situation where tests need to be ordered which is a big no no for unit tests. Why? Because each unit test should be independent from the other. Singletons solve one (and only one) problem. There aren't many examples. A log file is the big one. You don't want to just abandon a single log file. You want to flush, sync and close it properly. This is an example of a single shared resource that has to be managed. It's rare that you need a singleton. The reason they're bad is that they feel like a global and they're a fully paid up member of the GoF Design Patterns book. When you think you need a global, you're probably making a terrible design mistake. Some coding snobs look down on them as just a glorified global. In the same way that many people hate the goto statement there are others that hate the idea of ever using a global. I have seen several developers go to extraordinary lengths to avoid a global because they considered using one as an admission of failure. Strange but true. In practice the Singleton pattern is just a programming technique that is a useful part of your toolkit of concepts. From time to time you might find it is the ideal solution and so use it. But using it just so you can boast about using a design pattern is just as stupid as refusing to ever use it because it is just a global. Where have all the Singletons Gone makes the point that dependency injection has made it easy to get instances to constructors that require them, which alleviates the underlying need behind the bad, global Singletons decried in the first article. I think the confusion is caused by the fact that people don't know the real application of the Singleton pattern. I can't stress this enough. Singleton is not a pattern to wrap globals. Singleton pattern should only be used to guarantee that one and only one instance of a given class exists during run time. People think Singleton is evil because they are using it for globals. It is because of this confusion that Singleton is looked down upon. Please, don't confuse Singletons and globals. If used for the purpose it was intended for, you will gain extreme benefits from the Singleton pattern. One rather bad thing about singletons is that you can't extend them very easily. You basically have to build in some kind of decorator pattern or some such thing if you want to change their behavior. Also, if one day you want to have multiple ways of doing that one thing, it can be rather painful to change, depending on how you lay out your code. One thing to note, if you DO use singletons, try to pass them in to whoever needs them rather than have them access it directly... Otherwise if you ever choose to have multiple ways of doing the thing that singleton does, it will be rather difficult to change as each class embeds a dependency if it accesses the singleton directly. I believe this sort of pattern is called dependency injection and is generally considered a good thing. Like any pattern though... Think about it and consider if its use in the given situation is inappropriate or not... Rules are made to be broken usually, and patterns should not be applied willy nilly without thought. The singleton pattern is not a problem in itself. The problem is that the pattern is often used by people developing software with object-oriented tools without having a solid grasp of OO concepts. When singletons are introduced in this context they tend to grow into unmanageable classes that contain helper methods for every little use. Singletons are also a problem from a testing perspective. They tend to make isolated unit-tests difficult to write. Inversion of control (IoC) and dependency injection are patterns meant to overcome this problem in an object-oriented manner that lends itself to unit testing. In a garbage collected environment singletons can quickly become an issue with regard to memory management. There is also the multi-threaded scenario where singletons can become a bottleneck as well as a synchronization issue. A singleton gets implemented using a static method. Static methods are avoided by people who do unit testing because they cannot be mocked or stubbed. Most people on this site are big proponents of unit testing. The generally most accepted convention to avoid them is using the inversion of control pattern. Singletons are also bad when it comes to clustering. Because then, you do not have "exactly one singleton" in your application anymore. That sounds weird, but now you have many singletons in your application. And that is exactly what a singleton is not supposed to be: Having many objects of it. This is especially bad if you, as shown in this example, want to make synchronized calls to a database. Of course this is an example of a bad usage of a singleton. But the message of this example is: You can not rely that there is exactly one instance of a singleton in your application - especially when it comes to clustering. It is easily (ab)used as a global variable. Classes that depend on singletons are relatively harder to unit test in isolation. After reading Singletons are Pathological Liars as suggested in jason's answer I came across this little tidbit that provides the best presented example of how singletons are often misused. b. Singletons without state are (like factories) are not a problem. Singletons with state can again fall in two categories, those which are immutable or write once and read many (config/property files). These are not bad. Mutable Singletons, which are kind of reference holders are the ones which you are speaking of. In the last statement he's referring to the blog's concept of 'singletons are liars'. How does this apply to Monopoly? Now, for anybody who hasn't really played monopoly, these standards are ideal at best. A defeat in monopoly is hard to swallow because, monopoly is about money, if you lose you have to painstakingly watch the rest of the players finish the game, and losses are usually swift and crushing. So, the rules usually get twisted at some point to serve the self-interest of some of the players at the expense of the others. So you're playing monopoly with friends Bob, Joe, and Ed. You're swiftly building your empire and consuming market share at an exponential rate. Your opponents are weakening and you start to smell blood (figuratively). Your buddy Bob put all of his money into gridlocking as many low-value properties as possible but his isn't receiving a high return on investment the way he expected. Bob, as a stroke of bad luck, lands on your Boardwalk and is excised from the game. Now the game goes from friendly dice-rolling to serious business. Bob has been made the example of failure and Joe and Ed don't want to end up like 'that guy'. So, being the leading player you, all of a sudden, become the enemy. Joe and Ed start practicing under-the-table trades, behind-the-back money injections, undervalued house-swapping and generally anything to weaken you as a player until one of them rises to the top. Then, instead of one of them winning, the process starts all over. All of a sudden, a finite set of rules becomes a moving target and the game degenerates into the type of social interactions that would make up the foundation of every high-rated reality TV show since Survivor. Why, because the rules are changing and there's no consensus on how/why/what they're supposed to represent, and more importantly, there's no one person making the decisions. Every player in the game, at that point, is making his/her own rules and chaos ensues until two of the players are too tired to keep up the charade and slowly give up. So, if a rulebook for a game accurately represented a singleton, the monopoly rulebook would be an example of abuse. Aside from all of the obvious thread-safety and synchronization issues that mutable singletons present... If you have one set of data, that is capable of being read/manipulated by multiple different sources concurrently and exists during the lifetime of the application execution, it's probably a good time to step back and ask "am I using the right type of data structure here". Personally, I have seen a programmer abuse a singleton by using it as some sort of twisted cross-thread database store within an application. Having worked on the code directly, I can attest that it was a slow (because of all the thread locks needed to make it thread-safe) and a nightmare to work on (because of the unpredictable/intermittent nature of synchronization bugs), and nearly impossible to test under 'production' conditions. Sure, a system could have been developed using polling/signaling to overcome some of the performance issues but that wouldn't solve the issues with testing and, why bother when a 'real' database can already accomplish the same functionality in a much more robust/scalable manner. A Singleton is only an option if you need what a singleton provides. A write-one read-only instance of an object. That same rule should cascade to the object's properties/members as well. My answer on how Singletons are bad is always, "they are hard to do right". Many of the foundational components of languages are singletons (classes, functions, namespaces and even operators), as are components in other aspects of computing (localhost, default route, virtual filesystem, etc. ), and it is not by accident. While they cause trouble and frustration from time to time, they also can make a lot of things work a LOT better. The two biggest screw ups I see are: treating it like a global & failing to define the Singleton closure. Everyone talks about Singleton's as globals, because they basically are. However, much (sadly, not all) of the badness in a global comes not intrinsically from being global, but how you use it. Same goes for Singletons. Actually more so as "single instance" really doesn't need to mean "globally accessible". It is more a natural byproduct, and given all the bad that we know comes from it, we shouldn't be in such a hurry to exploit global accessibility. Once programmers see a Singleton they seem to always access it directly through its instance method. Instead, you should navigate to it just like you would any other object. Most code shouldn't even be aware it is dealing with a Singleton (loose coupling, right?). If only a small bit of code accesses the object like it is a global, a lot of harm is undone. I recommend enforcing it by restricting access to the instance function. The Singleton context is also really important. The defining characteristic of a Singleton is that there is "only one", but the truth is it is "only one" within some kind of context/namespace. They are usually one of: one per thread, process, IP address or cluster, but can also be one per processor, machine, language namespace/class loader/whatever, subnet, Internet, etc. The other, less common, mistake is to ignore the Singleton lifestyle. Just because there is only one doesn't mean a Singleton is some omnipotent "always was and always will be", nor is it generally desirable (objects without a begin and end violate all kinds of useful assumptions in code, and should be employed only in the most desperate of circumstances. If you avoid those mistakes, Singletons can still be a PITA, bit it is ready to see a lot of the worst problems are significantly mitigated. Imagine a Java Singleton, that is explicitly defined as once per classloader (which means it needs a thread safety policy), with defined creation and destruction methods and a life cycle that dictates when and how they get invoked, and whose "instance" method has package protection so it is generally accessed through other, non-global objects. Still a potential source of trouble, but certainly much less trouble. Sadly, rather than teaching good examples of how to do Singletons. We teach bad examples, let programmers run off using them for a while, and then tell them they are a bad design pattern. Singleton is not about single instance! Unlike other answers I don't want to talk about what is wrong with Singletons but to show you how powerful and awesome they are when used right! Solution: Use a single threaded bootstrap process to initialize all the dependencies of your singleton. Problem: It is hard to mock singletons. MyModel myModel = Factory.inject(MyModel.class); You can map MyModel to TestMyModel class that inherits it, everywhere when MyModel will be injected you will get TestMyModel instread. Problem: Singletons can cause memory leeks as they never disposed. Solution: Well, dispose them! Implement a callback in your app to properly dispose a singletons, you should remove any data linked to them and finally: remove them from the Factory. As I stated at the title singleton are not about single instance. Singletons improves readability: You can look at your class and see what singleton it injected to figure out what is it's dependencies. Singletons improves memory and performance: When some thing happens in your application, and it takes a long chain of callbacks to deliver, you are wasting memory and performance, by using Singleton you are cutting the middle man, and improve your performance and memory usage(by avoiding unnecessary local variables allocations). It is also considered an anti-pattern by some people, who feel that it is overly used, introducing unnecessary limitations in situations where a sole instance of a class is not actually required. It's not that singletons themselves are bad but the GoF design pattern is. The only really argument that is valid is that the GoF design pattern doesn't lend itself in regards to testing, especially if tests are run in parallel. Make sure that the Singleton is thread-safe. That's a given. The singleton should be simple in nature and not overly complicated. During the runtime of you application, where singletons need to be passed to a given object, use a class factory that builds that object and have the class factory pass the singleton instance to the class that needs it. During testing and to ensure deterministic behavior, create the singleton class as separate instance as either the actual class itself or a stub/mock that implements its behavior and pass it as is to the class that requires it. Don't use the class factor that creates that object under test that needs the singleton during test as it will pass the single global instance of it, which defeats the purpose. We've used Singletons in our solutions with a great deal of success that are testable ensuring deterministic behavior in parallel test run streams. I'd like to address the 4 points in the accepted answer, hopefully someone can explain why I'm wrong. Why is hiding dependencies in your code bad? There are already dozens of hidden dependencies (C runtime calls, OS API calls, global function calls), and singleton dependencies are easy to find (search for instance()). "Making something global to avoid passing it around is a code smell." Why isn't passing something around to avoid making it a singleton a code smell? If you're passing an object through 10 functions in a call stack just to avoid a singleton, is that so great? Single Responsibility Principle: I think this is a bit vague and depends on your definition of responsibility. A relevant question would be, why does adding this specific "responsibility" to a class matter? Why does passing an object to a class make it more tightly coupled than using that object as a singleton from within the class? Why does it change how long the state lasts? Singletons can be created or destroyed manually, so the control is still there, and you can make the lifetime the same as a non-singleton object's lifetime would be. if they do need be unit tested and do need to change the implementation, it's easy to change a class from using a singleton to having the singleton passed to it via dependency injection. I'm not going to comment on the good/evil argument, but I haven't used them since Spring came along. Using dependency injection has pretty much removed my requirements for singleton, servicelocators and factories. I find this a much more productive and clean environment, at least for the type of work I do (Java-based web applications). There is nothing inherently wrong with the pattern, assuming it is being used for some aspect of your model which is truly single. I believe the backlash is due to its overuse which, in turn, is due to the fact that it's the easiest pattern to understand and implement. Singletons are bad from a purist point of view. From a pratical point of view, a singleton is a trade-off developing time vs complexity. If you know your application won't change that much they are pretty OK to go with. Just know that you may need to refactor things up if your requirements change in an unexpected way (which is pretty OK in most cases). Singletons sometimes also complicate unit testing. 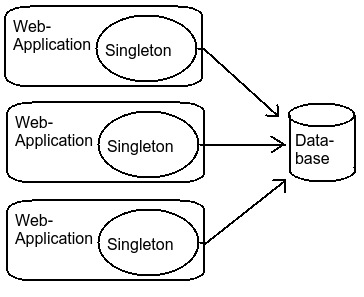 Singleton is a pattern and can be used or abused just like any other tool. The bad part of a singleton is generally the user (or should I say the inappropriate use of a singleton for things it is not designed to do). The biggest offender is using a singleton as a fake global variable. When you write code using singletons, say, a logger or a database connection, and afterwards you discover you need more than one log or more than one database, you’re in trouble. Singletons make it very hard to move from them to regular objects. Also, it’s too easy to write a non-thread-safe singleton. The problems with singletons is the issue of increased scope and therefore coupling. There is no denying that there are some of situations where you do need access to a single instance, and it can be accomplished other ways. I now prefer to design around an inversion of control (IoC) container and allow the the lifetimes to be controlled by the container. This gives you the benefit of the classes that depend on the instance to be unaware of the fact that there is a single instance. The lifetime of the singleton can be changed in the future. Once such example I encountered recently was an easy adjustment from single threaded to multi-threaded. FWIW, if it a PIA when you try to unit test it then it's going to PIA when you try to debug, bug fix or enhance it. Recent article on this subject by Chris Reath at Coding Without Comments. Note: Coding Without Comments is no longer valid. However, The article being linked to has been cloned by another user. Here is one more thing about singletons which nobody said yet. In most cases "singletonity" is a detail of implementation for some class rather than characteristic of its interface. Inversion of Control Container may hide this characteristic from class users; you just need to mark your class as a singleton (with @Singleton annotation in Java for example) and that's it; IoCC will do the rest. You don't need to provide global access to your singleton instance because the access is already managed by IoCC. Thus there is nothing wrong with IoC Singletons. GoF Singletons in opposite to IoC Singletons are supposed to expose "singletonity" in the interface through getInstance() method, and so that they suffer from everything said above. Singletons are NOT bad. It's only bad when you make something globally unique that isn't globally unique. However, there are "application scope services" (think about a messaging system that makes components interact) - this CALLS for a singleton, a "MessageQueue" - class that has a method "SendMessage(...)". in classes that implement IMessageReceiver. Too many people put objects which are not thread safe in a singleton pattern. I've seen examples of a DataContext (LINQ to SQL) done in a singleton pattern, despite the fact that the DataContext is not thread safe and is purely a unit-of-work object. Because they are basically object oriented global variables, you can usually design your classes in such a way so that you don't need them. A pattern emerges when several people (or teams) arrives at similar or identical solutions. A lot of people still use singletons in their original form or using factory templates (good discussion in Alexandrescu's Modern C++ Design). Concurrency and difficulty in managing the lifetime of the object are the main obstacles, with the former easily managed as you suggest. Like all choices, Singleton has its fair share of ups and downs. I think they can be used in moderation, especially for objects that survive the application life span. The fact that they resemble (and probably are) globals have presumably set off the purists. Firstly a class and its collaborators should firstly perform their intended purpose rather than focusing on deoendents. Lifecycle management (when instances are creared snd when they go out of scope) should not be part of the cladses responsibility. The accepted best practice for this is to craft or configure a new component to manage dependencies using dependency injection. Often software gets more complicated it makes sense to have multiple independent instances of the "singleton" class with different state. Committing code to simply grab the singleton is wrong in such cases. Using Singleton.getInstance() might be ok for small simple systems but it doesn't work / scale when one might need a different instance of the same class. No class should be thought of as a singleton but rather that should be an aplication of it's usage or how it is used to configure dependents. For a quick and nasty this does not matter- just luke hardcoding say file paths does not matter but for bigger applications such dependencies need to be factored out and managed in more appropriate way using DI. The problems that singleton cause in testing is a symptom of their hard coded single usage case/environment. The test suite and the many tests are each individual and separate something that is not compatible with hardcoding a singleton. Not the answer you're looking for? Browse other questions tagged design-patterns singleton or ask your own question. Are Singletons really that bad? Why is using the singleton pattern discouraged? Why are singletons considered to be a bad practice? Why is using a Global Variables class (singleton) bad practise? Are there any downsides to the singleton pattern? Is this correct way of creating a singleton class in C++?